Ludwig's angina (LA) is a serious, rapidly progressive cellulitis of the floor of the mouth which involves the submandibular, submaxillary, and sublingual spaces of the face; it is life-threatening if not recognized early and complications such as septicemia and asphyxia caused by expanding edema of soft tissues of the neck may occur. A literature review identified 35 pediatric cases of LA with a 14% mortality rate. It occurs predominantly in immunocompetent children with an odontogenic source of infection in a third and unknown source of infection in a third of cases. Many departments may have limited experience of the disease because of its rare occurrence. Hence, it is important to recognize LA in the earlier stages of the disease. We here present a case of huge LA in a 6-month-old male child with a very short history. Ludwig's angina (LA), first described by Hippocrates in the 4th century BC, is a serious, rapidly progressive cellulitis of the floor of the mouth and the tongue which is soft in consistency, grows hard, and becomes inflexible so that the patient would soon be suffocated unless relieved promptly. Over the past 60 years, LA has been less frequently reported due to improvements in dental hygiene and widespread antibiotic use. It is more prevalent in adults, but up to a third of cases are reported in children. An understanding of the anatomy of the submandibular space is essential to appreciate the clinical features and potential severity of this infection. The infection begins in the submaxillary space and ascends through the free posterior edge of the mylohyoid into the sublingual space. This explains the clinical features of a painful, diffuse, brawny swelling of the neck followed by elevation and posterior displacement of the tongue and floor of the mouth with acute airway compromise. A case of LA in a 6-month-old male is presented with a literature review of pediatric cases. 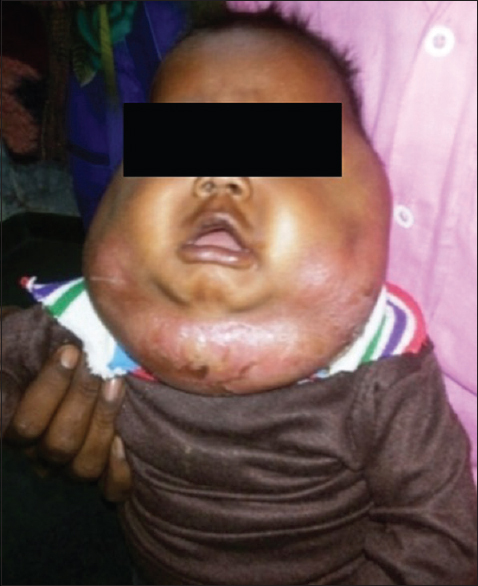 A 6-month-old boy, with no systemic disease, was referred to our clinic with a complaint of fever and bilateral significant submandibular swelling that rapidly progressed to the submental area [Figure 1]. The complaints started 48 h ago. According to intraoral examination, he had tender swelling of the floor of the mouth, which was displacing his tongue superiorly. He had no complaints of inability to open mouth, swallowing, eating, and respiratory distress. On physical examination, the child was febrile (38°C), heart rate was 140 beats per minute, respiratory rate was 30 breaths per min, and oxygen saturation was 99% with no pain and malaise. White blood cell count was 28,000 cells/mm3 and hemoglobin was 8.4 g/dl. Based on his history and symptoms, the diagnosis of LA was suspected. There was no dentition. He was previously well and fully immunized. Panoramic radiograph was normal. We did incision and drainage [Figure 2]. 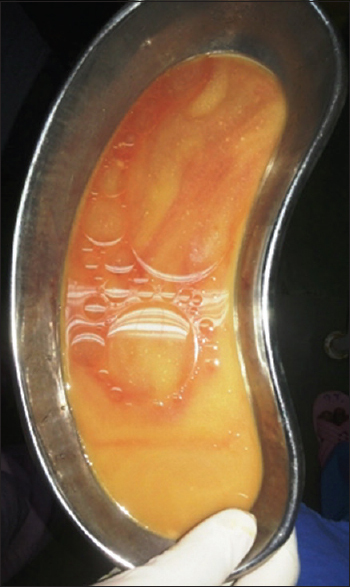 and approximately 1 L of pus was drained [Figure 3]. There was no need of intubation. At 1-month follow-up, his complaints were fully rectified, the wound site healed, and no pain or infection was found clinically. LA is two to three times more common in boys when compared to girls. In our case, it was in a male child. Conventionally, LA has been more commonly seen in patients with poor oral hygiene. Most of the cases are due to infected lower molars, which are a result of inflammation of the soft tissues surrounding the crown of a partially erupted tooth, most commonly the second or third molar. In our case, there was no dentition. Although LA usually develops in immunocompromised persons, it can also develop in healthy individuals. In children, LA has an identified odontogenic source, with only 50% of the cases, in contrast to the 70%–90% incidence of odontogenic origin reported in adults. Other etiologic sources in children include oral mucosal lacerations, submandibular sialadenitis, mandibular fractures, herpetic gingivostomatitis, tongue piercing, and lymphatic vascular malformation, which can cause this disease. LA has also been reported in children with systemic diseases such as immune deficiency and diabetes mellitus. LA, a rapidly progressive cellulitis of the floor of the mouth, involves the submandibular and sublingual spaces of the face. The infectious process expands superiorly and posteriorly, elevating the floor of the mouth and the tongue. The hyoid bone limits the process inferiorly, and swelling spreads to the anterior aspect of the neck, causing distortion and a “bull neck” appearance. This causes displacement of the oral tongue both superiorly and posteriorly, producing a potentially life-threatening obstruction of the airway at the level of the oral cavity and oropharynx. Patients can have swelling, pain, and elevation of the tongue, malaise, dyspnea, fever, neck swelling, redness of the neck, and dysphagia. The submandibular area can be sometimes with palpable crepitus. The fatality rates reported were 54%–60% due to airway obstruction. Needle drainage can be performed to reduce the risk of spreading infection. Microorganisms that cause Ludwig's abscesses vary, but the most commonly cultured organisms are aerobic and anaerobic species, including Staphylococcus, Streptococcus, and Bacteroides. Optimum airway management is controversial and includes tracheal intubation, emergency tracheostomy, and surgical decompression. In 1942, Taffel and Harvey advocated aggressive management of early LA with wide surgical decompression of the submandibular and sublingual spaces under local anesthesia, resulting in a mortality rate of <2%. An artificial airway in all patients with LA was the standard practice 30 years ago, but there has been a recent shift toward observation in a safe environment with airway intervention by tracheal intubation only if signs of impending airway obstruction develop. Pediatric patients with LA are reported to require active airway intervention less frequently than in adults, and it has been suggested that the presence of dental caries, which is more common in adults, is related to a more severe progression and increased need for airway intervention. We also did not require any airway intervention and did incision and drainage with local anesthesia. Abscesses should be drained, infected tooth should be extracted, and a broad-spectrum antibiotic should be given. Antibiotic selection varies, although a penicillin, clindamycin, or metronidazole is frequently used. Early diagnosis and appropriate antibiotic therapy cure the disease without surgical procedures. In our case, the patient responded to surgical treatment, complications were prevented with appropriate antibiotics, and had no need for tracheostomy. Submandibular and sublingual infections can progress into LA in a few hours, despite the use of antibiotics. Therefore, every facial soft-tissue infection should be treated immediately to prevent LA. It must not be forgotten that this disease may be seen in children. Eliminating the etiologic factor and administrating antibiotics may be sufficient treatment in early stages. The authors would like to thank Dr. Annu Bhandari, Radiologist, Senior Professor, SMS Medical College, Jaipur, for providing support. Britt JC, Josephson GD, Gross CW. Ludwig's angina in the pediatric population: Report of a case and review of the literature. Int J Pediatr Otorhinolaryngol 2000;52:79-87. Lin HW, O'Neill A, Cunningham MJ. Ludwig's angina in the pediatric population. Clin Pediatr (Phila) 2009;48:583-7. David M. Lemonick DM. Ludwig's angina: Diagnosis and treatment. Hosp Physician 2002;38:31-7. Srirompotong S, Art-Smart T. Ludwig's angina: A clinical review. Eur Arch Otorhinolaryngol 2003;260:401-3. Chen CJ, Huang YC, Lin TY. 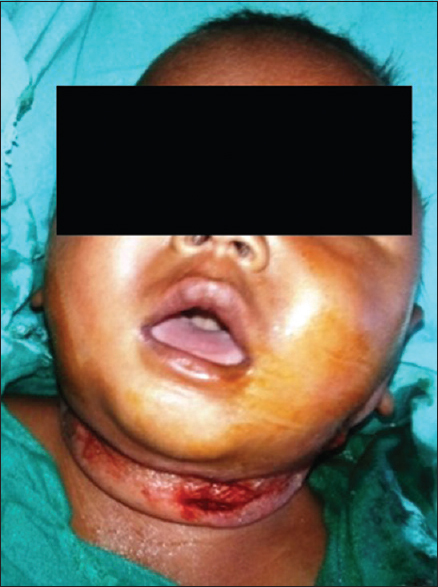 Ludwig's angina following herpetic gingivostomatitis in a toddler with tetralogy of fallot. J Formos Med Assoc 2004;103:311-3. Yu CH, Minnema BJ, Gold WL. Bacterial infections complicating tongue piercing. Can J Infect Dis Med Microbiol 2010;21:e70-4. Yash CS, Hiren DP, Haren BP, Hitesh SD, Bijal CB, Shah UH. Ludwig's angina: Diagnosis and management – A clinical review. J Res Adv Dent 2014;3:131-6. Lemonick DM. Ludwig's angina: Diagnosis and treatment. Hosp Physician 2002;38:31-7. Nicholas HB, Mudassar B. A case of Ludwig's angina: Life threatening deep neck infection presenting with unusual symptoms of chest pain. Br J Med Med Res 2014;4:1552-7.